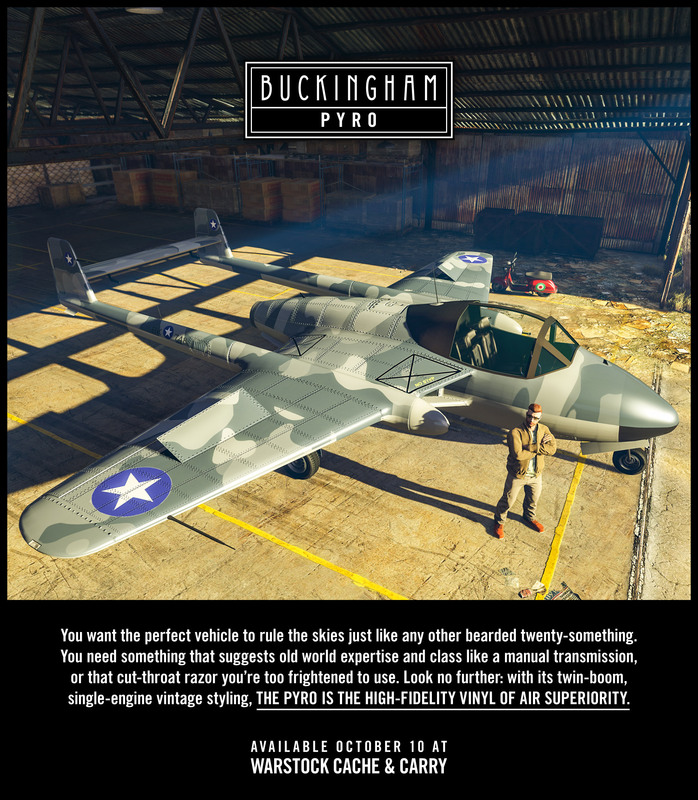 As of October 11th, the Buckingham Pyro is available for purchase through Warstock Cache & Carry. This jet powered fighter comes equiped with dual wing-mounted machine guns for areal engagements. It can be upgraded in your personal hangar workshop with a variety of features, including homing missiles, armor, liveries, engine and handling upgrades, and more. Starting October 11th, take advantage of Double GTA$+RP in the recently released Stockpile Adversary Mode. Fight for control of the objective high above San Andreas in this jet-fueled take on capture the flag. Additionally, the Battle Royale style Motor Wars Adversary Mode will also issue a double payout, and Bunker Research and Manufacturing+Biker Business Production will run at a 25% accelerated rate. All Discounts, Bonuses and Double GTA$+RP events valid through October 16th.